What did fans ever do to deserve being insulted by your ingratitude, Pittsburgh? 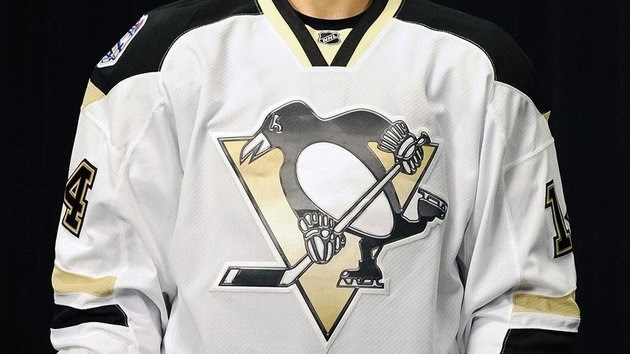 Earlier today the Penguins unveiled their new jersey for the Stadium Series. If the New York Islanders' SS jerseys were a bit uninspired, the Penguins' new threads are lackadaisical. "OooOOooh!" That, I assume, is the anticipated response from Pens fans as the main difference in the jerseys is that the new one is shinier than the others. That's right: the Penguins organization expects fans to shell out cash for an insignificantly dissimilar jersey just because it's shiny and new. Players, of course, offered a different interpretation of the uniform in their talking points. Winger-turned-model Chris Kunitz confessed his feelings about the jersey to the Penguins website (what a scoop! ): "I like the logo with the silver accent and metallic look." Translation: "It's shiny--buy. BUY!" Unless the shiny logo has adapted Archimedes' burning mirrors in order to enable the Pens to set the Blackhawks on fire, I don't see how this jersey is better suited for outdoor games than the regular away jersey. Without such a conflagration, it's had to justify referring to this slightly changed garb as a "new jersey." Teams need to stop the "subtle difference" approach to designing jerseys for one-time events like the Stadium Series. At best, the only thing this approach accomplishes is an unknown number of violent altercations that are sure to occur when drunk fans mistake the slightly different jersey as a knock off. At worst, this apathetic approach merely implies that outdoor games are a blatant cash-grab for the NHL. If the latter scenario is true, then teams playing in involved in the Stadium Series might as well wear Florida Panthers and Phoenix Coyotes jerseys since the money earned from these events will be used to keep cash-strapped teams floating just above insolvency. Why not make these spectacles more spectacular by releasing daringly original jerseys? 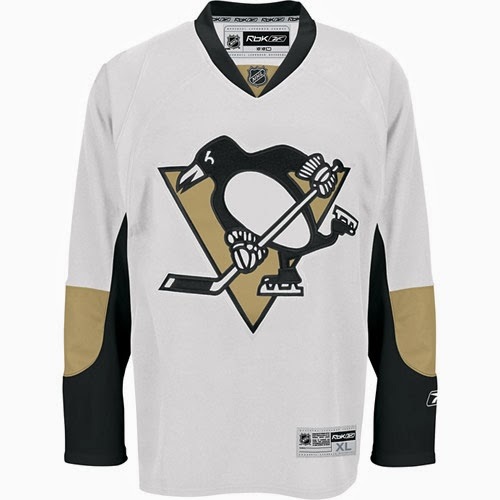 They're only going to be worn once, so why not make the occasion memorable by designing a jersey depicting the chimerical penguin from that plagued Adam Sandler in Billy Madison? The Billy-Madison idea might also provide context for this old NHL commercial. If making money is the main point behind these one-time uniforms, why not cash-grab for the stars by partnering with Warner Bros. and designing a Happy Feet Penguins jersey? If nothing else, design something hideous that fans across the league will enjoy mocking for decades to come. The varied uniforms will sell regardless of how subtle or bold the designs are, so why not show offer fans something memorably original to justify taking their money? The NHL's Unluckiest Number: 13, 69 or 66? If I ran the Oilers . . .